Although the surface of Venus cannot be seen from Earth because of the thick clouds surrounding the planet, some features have been detected by Earth-based radar. In the 1960s, both the USSR and USA began sending space probes to Venus. Reaching the surface proved to be more difficult than anyone expected because the atmospheric pressure was so great that it crushed many early craft. Instruments on Venera 7 found the surface temperature was 475°C and the surface pressure was 90 atmospheres (about the same as the pressure at a depth of 1 km in Earth's oceans). The black-and-white photographs returned from the Venera 9 lander showed a rocky terrain with basaltic stones several centimetres across and soil scattered between them. The temperature at the landing site was 460°C and wind speed was only 2.5 km/h. The terrain around the lander from Venera 10 was more eroded than at the Venera 9 landing site. 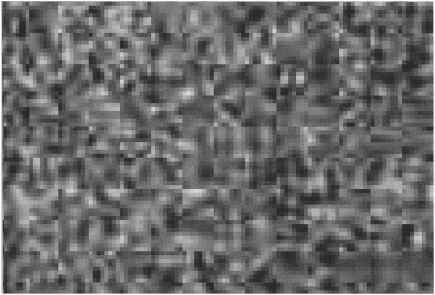 Soil analysis by Venera 14 showed the surface rock type to be basaltic, similar to that found at mid-ocean ridges on Earth. Veneras 15 and 16 produced a map of the northern hemisphere from the pole to 30°N and found several hot spots that possibly were caused by volcanic activity. Most of the surface of Venus consists of gently rolling plains with no abrupt changes in topography. There are also several broad depressions called lowlands, and some large highland areas including two named Aphrodite Terra and Ishtar Terra. The highland areas can be compared to Earth's continents, and the lowland areas to its ocean basins. Several canyons and a few rift valleys were also mapped. There are no small craters on Venus, probably because small meteor-oids burn up in Venus's dense atmosphere before reaching the surface. There are some large craters and these appear to come in bunches, suggesting that large meteoroids break up into pieces just before hitting the ground. The best pictures of the Venusian surface came from the orbiting US spacecraft Magellan, which produced detailed maps of Venus's surface using radar. Images from Magellan confirmed that that much of the surface is covered by flat rolling plains with several highland regions. 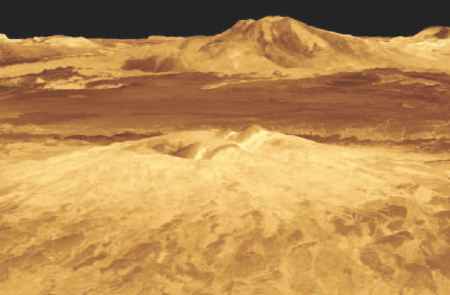 The highest mountain on Venus is Maxwell Montes, situated near the centre of Ishtar Terra and rising to around 11 km above the mean surface level. Maxwell Montes is about 870 km long. Recent data suggests that Venus is still active volcanically, but only in a few hot spots. There is evidence of lava flows, volcanic domes, collapsed volcanic craters and volcanic plains. There are also several large shield type volcanoes (similar to those at Hawaii). Two large and possibly active shield volcanoes are Rhea Mons and Theia Mons, which tower 4 km high.